Former Member of American Federation of Violin & Bow Makers, Inc.
and is making select instruments on a limited basis. Essentially unchanged for over four hundred years, the tradition of violin making continues to be an endeavor of painstaking patience and attention to detail. Jeff Manthos has dedicated himself to this pursuit. Jeff weds proven acoustic concepts with personal artistic style, creating beautiful instruments that are a pleasure to play. After studying music and viola performance at the University of Northern Colorado and obtaining his Bachelor of Arts degree, Jeff enrolled at the renowned Violin Making School of America. Following four years of intensive study, including violin construction, varnish, instrument identification and violin history, he began work at the Thomas Metzler Violin shop in Los Angeles, continuing his study of master instruments, repair and restoration techniques. Jeff later moved to Portland Oregon, joining the staff of the David Kerr Violin Shop. He continued repair and restoration work, and began learning the business side of running a large shop, ultimately becoming shop manager. Since opening his own studio, Jeff devotes all his time to instrument making. Using traditional tools, his hands-on approach yields genuine character and artistry, and avoids the excessive use of machine tools, which sacrifice individuality for expediency. Jeff takes as much time as needed to fully realize the potential in each select piece of wood. He makes his own varnish from traditional compounds and carefully applies it by brush. In the final phase of set-up, Jeff draws upon years of shop experience to render the instrument responsive and easy to play. "I feel privileged to have found my life's work in violin making. With inspiration drawn from Brescian, Cremonese and Venetian makers of the past, I strive to bring something personal and unique to each instrument. I look forward to continuing the tradition in the new century." Obtaining an instrument from Jeff Manthos guarantees you expertise, quality and authenticity. The Oregon Folklife Network invited Jeff to join a discussion panel on musical traditions being practiced in the area. It will be held at Troubadour Music in Corvallis on Friday September 7th at 7:30 pm. Jeff was recently commissioned to write a short piece for the nationally distributed Vietnam Veterans of America magazine. It will appear on the Parting Shot page in the upcoming issue. Northwest Musical Instrument Exhibit: Saturday and Sunday, April 28th & 29th, 2018 Marylhurst University, Lake Oswego, Oregon. The 17" Maggini modeled viola is sold and Jeff recently finished a 15" viola of his own design and it is now available. He also has his Sanctus Seraphin patterned violin from 2006 back in his shop. 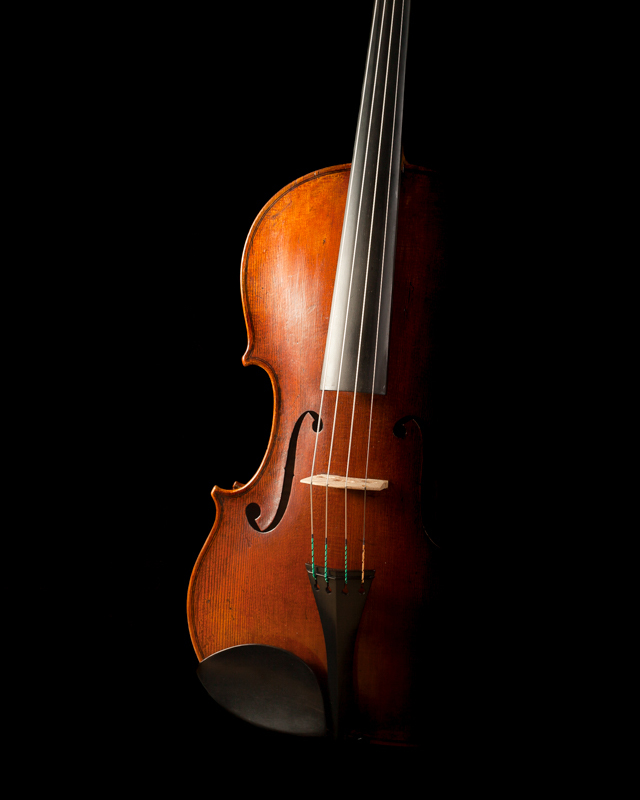 This violin was exhibited in the Library of Congress that year as part of the American Federation's participation in "The American violin, from Jefferson to jazz" event. Jeff recently sold a violin based on a 1704 Stradivari as well as a 15 7/8" viola of his own design. He has started two new violas, one on the popular 15 7/8" pattern and one on his 16 1/8" pattern. He expects them to be completed by spring. Jeff just completed a 17" viola based on a Maggini pattern from the late 1500's. Instrument Show Northwest Musical Instrument Exhibit: Saturday and Sunday, April 25th & 26th, 2015 Marylhurst University, near Portland, Oregon. Jeff is completing a 16 1/2" Da Salo model viola which will be available soon. His next instrument is a 15 3/4" viola on his own pattern, which will be ready by late spring.